With its spectacular, stainless steel, stepped-dome top surmounted by its spear-like spire, the Chrysler Building is easily the world's most identifiable skyscraper. For a few months, it was the world's tallest until it was surpassed by the Empire State Building. Other towers may lay claim to being taller now or being more innovative, but the Chrysler top is a magical sorcerer's wand, a phantasmagoric pinnacle worthy of the land of Oz. There were the pyramids, the Colossus of Rhodes, the great Medieval and Gothic cathedrals of Europe and in "modern" times only the Eiffel Tower, the Woolworth Building and the Chrysler Building: man-made monuments that transcended the parochial vision to inspire delirium and fantasy. The project was initially undertaken by William J. Reynolds, a former New York State Senator whose major prior achievement in real estate had been, appropriately, "Dreamland" in the Coney Island amusement district in Brooklyn. In the late 1920's, New York became obsessed with breaking records for the world's tallest building. It was the Golden Age of Art Deco skyscrapers, heroic in conception and romantic in execution. A 1,600-foot tower was planned for lower Broadway and a 1,200-foot tower on 42nd Street between 8th and 9th Avenues on the present site of the former McGraw-Hill Building, but they did not come to fruition. Reynolds leased the site of the Chrysler Building from Cooper Union and hired architect William Van Alen, who had gained favor for a building he had recently completed for the Childs restaurant chain on Fifth Avenue. Van Alen had formerly been a partner of architect H. Craig Severance, who was designing with Yasuo Matsui, what was then planned as the world's tallest building for the Bank of Manhattan at 40 Wall Street. Van Alen originally had planned a 56-story tower to beat out the proposed 55 stories of the Lincoln Building at 60 West 42nd Street. When J. E. R. Carpenter, the architect of the Lincoln Building project, upped his project to 63 stories, Van Alen went back to the drawing board and proposed a 65-story tower that soon became a 67-story, 808-foot-high tower with an observatory with a rather squat glass dome that was to be illuminated from within at night. The Lincoln Building project ultimately decided to only build 54 floors. Walter P. Chrysler, the automobile magnate, decided that his company could benefit from developing the world's tallest building and he took over Reynold's plan and Van Alen's designs. According to Robert A. M. Stern, Gregory Gilmartin and Thomas Mellins in their excellent book, "New York 1930, Architecture and Urbanism Between The Two World Wars," (Rizzoli International, 1987), Chrysler did not did not instruct Van Alen to radically change the building's form, but to increase its height to 925 feet and add some decorative touches to herald his cars. When word got out that the Bank of Manhattan tower was being redesigned with the addition of a flagpole atop its lantern-bedecked pyramidal roof that would be two feet tower than his project, Chrysler gave the go ahead to Van Allen to not only prevail against his former partner's project, but to surpass even the 1024-foot-high Eiffel Tower, the world's tallest structure at the time. Stern, Gilmartin and Mellins note that Chrysler subsequently had second doubts about the wisdom of such an ambitious plan during construction, but persevered. In what was certainly one of the greatest secrets and publicity coups in Manhattan real estate history, the stainless steel top was installed to the public's, and the Bank of Manhattan's, utter surprise in about 90 minutes in November, 1929. The tip of spire was 1046 feet high. The stainless steel cladding had been hidden in five pieces within the building's shell and was hoisted out of the top of the building and riveted into place. What is remarkable about the stainless steel cladding is how much of the top it covered and, more importantly, how original, striking and exotic was its intricate design. The stainless steel cladding was ribbed in a radiant pattern and had many triangular windows that followed the parabolic curves of the seven narrow steps of each of the crown's four facades. The general massing of the building's base and shaft is rather unremarkable, but the building's apex is breathtakingly brilliant. "The most extraordinary transformation was the evolution of the building's crown into a fantastic, terraced dome, an invention almost as allusive, bizarre, and sculpturally complex as a church finial by Borromini. Van Alen's design was a sort of cruciform groin vault sliced in seven concentric segments that mounted up one behind the other. The whole complex swelled upward toward the center, and as they did their shapes were progressively distorted from a pure semicircle at the bottom of the finial to a thin parabola that stretched toward the vertex," (Van Alen's word for the spire), Stern, Gilmartin and Mellins noted. Van Alen's original facade treatment called for a Middle- or Far Eastern-like patterning of its white, gray and black brickwork. The final design of the main shaft is particularly effectively in its corner banding patterns that while horizontal accentuate the 77-story tower's verticality and gives it shaft considerable rhythmic energy. Chrysler had Van Alen incorporate some decorative designs associated with automobiles on the facades, namely simulated hubcaps near the top of one rung of setbacks and great stainless steel eagle gargoyles, two at each of the shaft's four major corners. Margaret Bourke-White, the photographer, had a studio on the building's 61st floor and posed atop one of the eagle gargoyles in a famous photographer. At a lower setback, stainless steel Chrysler-like hood ornaments serve as ceremonial winged urns. The hubcaps, eagles and hood ornament decorations, however, are barely noticeable from the street and the building's base is surprisingly spartan. 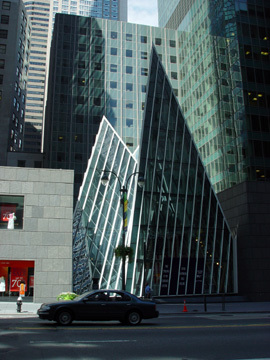 The main entrance is on Lexington Avenue, but there are also entrances on 42nd and 43rd Streets, all of which open onto the building's surprising, triangular lobby. The street entrances are recessed in angled openings that many critics noted were decidedly funereal in tone and almost coffin-shaped. There is no denying that the building's exterior, apart from its glorious top, is very bland, almost dreary, from the sidewalk or nearby streets. The interiors, on the other hand, are another surprise. Despite its magnificent marbles and interesting ceiling murals, the lobby was very dark for decades until the building's new owner, Tishman Speyer Properties, undertook a major restoration that was completed in 1999 and revealed the rather fascinating murals, as shown below. It is illuminated with some simple Art Deco light fixtures whose emanation is amplified by reflections along its exceedingly luscious red Moroccan marble walls, yellow Siena marble floor and amber onyx and blue marble trim. The large lobby ceiling is covered by a mural, entitled, "Energy, Result, Workmanship and Transportation," by Edward Turnbull. The elaborate and confusing mural contains a large image of the building, a plane, workers, and decorative patterns. As much of the ceiling has recessed lighting and the overall illumination in the large space is quite low, it is very difficult to appreciate the mural on which the artist allegedly used some of the building's construction workers as models. The 100 by 76 foot mural was covered in the 1970's with a coating that darkened it and and spotlights were cut into it. As part of a $100 million renovation project by Tishman Speyer Properties, that included the reclading with glass of the white-brick annex office tower at Third Avenue and the creation of angled, prismatic structures in the low-rise spaces between the annex and the Chrysler Building, the mural was restored in 1999 by the EverGreene Painting Studios. The elevator banks, however, are well lit and have bedazzling elevator doors with rare wood marquetry, as shown at the left. These doors are Art Deco masterpieces. The lobby was restored in 1978 and JCS Design Associates and Joseph Pell Lombardi were the architects involved in the restoration. A stairwell to the mezzanine and basement levels has a very attractive Art Deco chrome banister and walls similar to the lobby. It is a much more effective space than the lobby, perhaps because of its smaller size and the tactile act of using the banister on the stairs. The act of climbing up or down in this stairwell is somewhat akin, if one doesn't mind reverse psychology, to wearing a fur coat inside out; the sensuality of the fabulous marbles is overwhelming and refreshing. The Chrysler Building had a great interior public space, its small observatory whose walls, not far beneath the base of the spire, slanted inwards daringly. Sadly, the observatory has long been closed to the public. Also sadly, the building's famous private luncheon club, known as the Cloud Club, has been shut for many years. Its Art Deco decor, however, was slight and not significant. The building was eventually bought by Sol Goldman and Alex Di Lorenzo and then was acquired by the Massachusetts Mutual Life Insurance Company and subsequently sold to Jack Kent Cooke, a Washington, D. C. investor. A Chrysler East building at 666 Third Avenue was built in 1951 at the eastern end of the same block, but the intervening low-rise, mid-block properties were never assembled. The Chrysler East building, designed by Reinhard, Hofmeister & Walquist and now known as the Kent Building, was the second worst office tower to be built in Manhattan after World War II. It is a cream-colored, 32-story box that bears no trace of a relationship with the Chrysler Building and has absolutely no distinction. In 1997, Tishman Speyer Properties, which purchased it and the Chrysler Building announced that it would be reclad and the low rise-buildings between the two tower redeveloped in a design by Philip Johnson and other architects. The recladding of the East Building on Third Avenue was attractively finished in green glass although its contextural relationship to the Chrysler Building is rather ambiguous. The new facade is handsome, and the new "pylons" designed by Philip Johnson as the centerpiece of the block's 42nd Street retail frontage is appropriately dramatic and recalls some of the daring of the top of the Chrysler Building. In mid-2003, the central space had not yet been leased. The base of the angular pylons has a narrow, small pool fronting on the sidewalk. The overall effect of the new retail pylons is nice, but not sensational, but they are nonetheless welcome. Chrysler refused to pay Van Alen his fees because he believed he had entered into some dubious financial arrangements with some of the building's contractors. Van Alen sued but the matter was dropped. Van Alen's design had become world famous, but he encountered another problem, the Depression, and never worked on another major project. The Chrysler Building disappoints you when you walk by and exhilarates you when you view it from a distance. In the 1980's, the triangular windows were illuminated at night, making it New York's answer to a rocket liftoff at Cape Kennedy. Van Alen would be happy.